The Oasis - a Child Advocacy Centre and Home For Rescued & Abandoned Babies. The Oasis provides a nurturing shelter to children who have been rescued from different situations or abandoned by their parents. It houses a small number of children in order to foster a family-style environment filled with the support and love necessary until repatriation or adoption is possible. It also operates as a drop-in centre for at-risk children to come in and talk to trusted adults, learn English, have a meal, or play. This allows the children to have a safe and fun environment to look forward to daily before going home to their families in the evening. 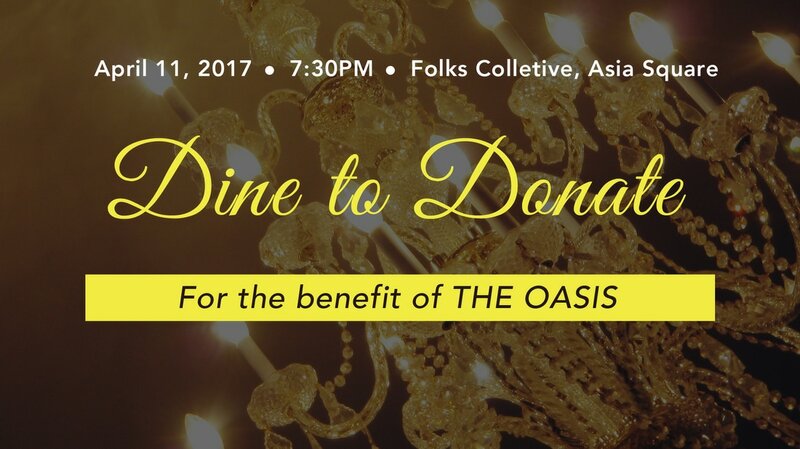 Fee: $50/person, includes a set Thai dinner. Excludes drinks. A casual dinner with friends and new friends. A short presentation about The Oasis and partnership opportunities through volunteering, giving or advocating. And donation of $32 to The Oasis made under your name. Please register to reserve a seat. Please indicate the same email address here and on Give.Asia's page so we can keep track of your payment. If paying through bank deposit/transfer: email ask@givingissocial.com to receive the bank account details.